I used to have a massively long page about this course, explaining everything you'd possibly want to know. You can still read it if you want, but I want to respect your time. That's why this page is shorter (about 93% shorter) and much more direct. If you're here right now, reading this page, it means you're serious about this filmmaking thing. It means you've got big dreams of making films you care about and making a living with it. If that doesn't sound like you, that's ok. But this course isn't for you. But if you’re ambitious, chances are there’s a gap between where you are right now, and where you want to be in your career. The Filmmaker's Guide to Success is a four-week online course that’ll help you close the gap. You’ll learn to design and make consistent progress towards your ideal career in film. It doesn't focus on what gear to buy, or how to make your images more "cinematic." It’s definitely not one of those “how to make a movie” courses. Instead, it's about deeper strategies for getting what you want out of life. Craft a big, compelling vision for the filmmaking career you want. Quit procrastinating and make time in your busy schedule. Build a rock solid daily routine, and make it habitual. Identify the "core work" that helps you move the needle so that you can stop wasting time on stuff that doesn't work. Set smart short term goals that help you make progress quickly. Earn a good living as a filmmaker and diversify your income. Make films you're proud of, and build a body of work that opens doors in your career. Conquer the internal barriers that are holding you back (fear, perfectionism, etc). Become an effective networker, tribe builder, and leader. Plus lots of other useful, counterintuitive stuff. 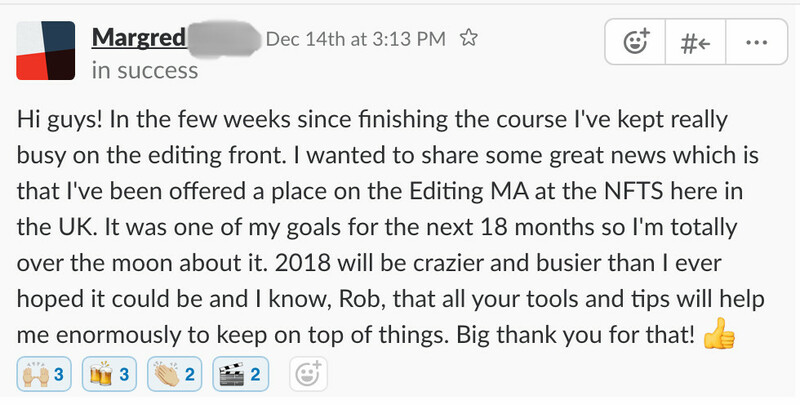 My big promise is that by the end of your 31 days in the course, you’ll have a wide range of tools for crafting your own successful path through the world of film. If you use these tools, even just a handful of them, you will see results. It won’t be easy, and it certainly won’t happen overnight. But if you show up consistently and focus on the right things, the results will come. And if you’re skeptical about that claim, that’s why I have a five year money back guarantee on this course. You can read more about that down below. But if you’re ready to take the plunge and start building a great career, click this big fancy button. Sounds Great Rob. I'm In! 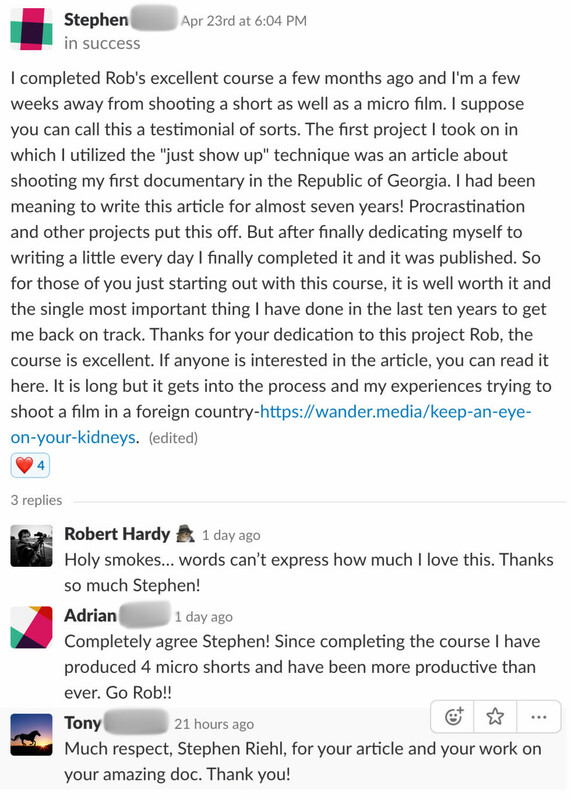 The coolest thing about this course—the thing I'm most proud of—is that it forces you show up every single day and make consistent progress on your film goals. Most online courses are easy to consume, but hard to implement in your life. I’ve done that more times than I care to admit. So I designed the Filmmaker's Guide to Success to be different. It's delivered one lesson per day, and uses community and daily check-ins for accountability. If you follow the directions and show up consistently, by the end you'll have a habitual routine.Then it's just a matter of filling that routine with your own tasks, your own work. By completing this course—merely completing it—you'll be set up to start making legit progress in your career. Trust me, life has a way of rewarding those who show up consistently and work on important things. Even 20-30 minutes a day of that can move the needle. And the Filmmaker's Guide to Success shows you exactly how to do that, step-by-step. Now you're probably thinking... does it actually work? Will this really help me make progress on my big film goals? These are unsolicited comments left by students in the course community. They speak for themselves. I’ve got an entire folder of these screenshots, but again, I don’t want to waste your time. So let’s wrap this up with a few more things you should know. I believe in this course so much, that I'm backing it up with a guarantee that most of my business friends think is insane. If you make an honest attempt at doing the work, and don't see results after that amount of time, I don't deserve your money. And I'll give you back every last cent. All I ask is that if you request a refund, you show me proof that you've been doing the work. Maybe we can even jump on a call for a few minutes and you can tell me how to make the course better. Fair warning though. If you buy the course, ask for a refund, but don't do any of the work, I'll probably say no. So please don't buy this course unless you're serious. How Much Does the Filmmaker's Guide to Success Cost? $300, or six monthly payments of $50. Your choice. This Sounds Great! How Can I Sign Up? By clicking this fancy button. That’s how! You should read this page first, and if your question still isn't answered, email me at robert@filmmakersprocess.com. I'll get back to you as quickly as I can. Thanks for considering the course, and I hope to see you inside.